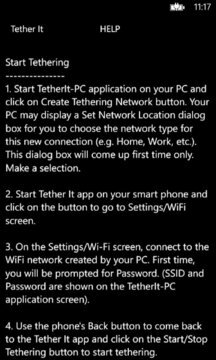 The "Tether It" app for Windows Phone 8 implements WiFi tethering for Windows based laptops and PCs, without requiring a tethering plan from your carrier. You use this app to share your smart phone's Internet connection with your computer (over WiFi) by following a few simple steps. Tether It uses the Wireless Hosted Network feature supported on Windows 7, Windows Server 2008 R2, and newer Windows operating systems. You also need a Hosted Network capable wireless adapter in your laptop/PC. Most newer computers use such an adapter. If your PC is running any pre-Windows 7 operating system or uses a wireless adapter that is not capable of supporting Hosted Networks, then Tether It will not function for you. (The easiest way to find out if your system has the required hardware and software is to download Tether It and give it a try!) PLEASE DOWNLOAD THE TRIAL VERSION FIRST. IF IT WORKS WELL FOR YOU, THEN YOU CAN UPGRADE. WPA2 based security is used over the WiFi network to prevent unauthorized users from connecting to your tethering network (e.g. at an airport or other public places). The Tether It app is very simple to use. There is no need to enter any commands at the Windows command prompt. Also, this app does not use any proxy server, so there is no proxy setting changes required in the browser (or anywhere else on your PC). ALL applications running on your PC will be able to use the Internet connection provided by your smart phone. The tethering created by Tether It is not limited to the PC's browser only. For example, you can run your company's VPN over the tethered connection, or any other non-browser based application, such as Outlook, etc. The Tether It app is free to download and try. The free version will limit the tethering time to 5 to 6 minutes. If you are happy with its performance and ease-of-use, please do an in-app purchase to remove this restriction.